Calligra Team Pleased to announce the release of New release 2.8.3 of the calligra suite and this is the third and final update of 2.8 series. caligra office suite is complete Open source and free to use and it mainly for Linux / BSD Operating systems. 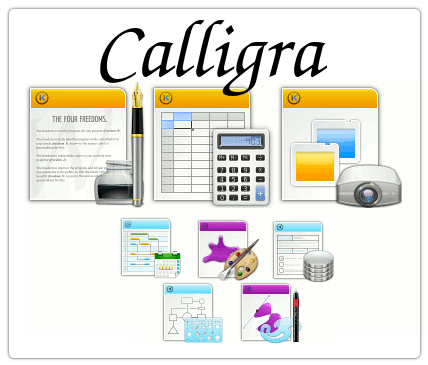 calligra contains all the applications such as Word, PowerPoint, Spreadsheet, flow and planning. Add support for line breaks when reading the OpenDocument Format. Fix a bug in the style manager for filters. Make the text shape (specifically the dock panel) work on Windows 8.1. Excel document support: add support for 1904-based XLS files, typically created by Excel on Mac OS X.
I have not had success using Kubuntu 14.04 (x86_64). Calligra is still pulling from the Universe repo (version 2.8.1). Have you tested this on 14.04? I just checked and Ubuntu 14.04 does not have Calligra in backports. Ubuntu 13.10 and 13.04 only have 2.8.2. It seems your blog post was in error.